Two of my primary resolutions for 2010 involve balance and pruning. I need to live my life with more balance, including more time spent reading God’s Word, praying, and inviting his Holy Spirit to take charge of my life. I need to “prune” activities in and from my life, and seek God’s guidance in this process. 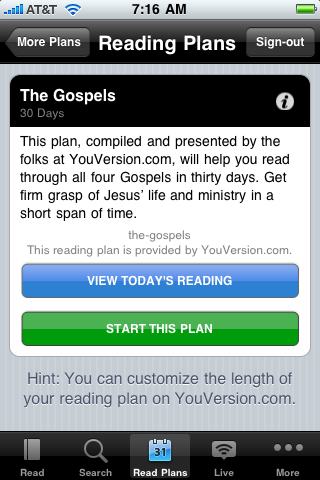 I recently updated the free YouVersion Bible application on my iPhone, and discovered the authors have added a variety of daily Bible reading plans in addition to the original plan by Robert Roberts. After logging in with a free account you create on YouVersion, click READ PLANS at the bottom of the application to view available plan options. After selecting a plan, you can read more information about it including how long each plan will take to complete. 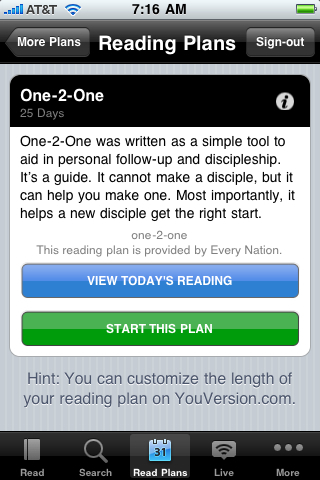 Verses included in each day’s reading plan are linked, and backlinks are provided which return directly to the day’s plan. 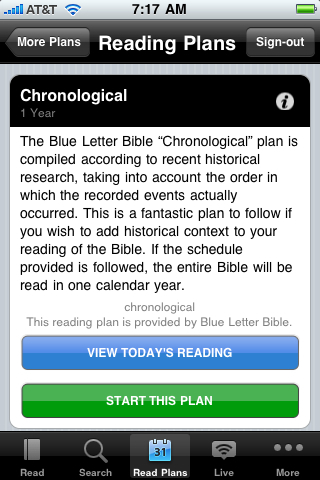 You can also return to your plan by clicking the READ PLANS button at the bottom of the app. Like many other mobile applications today seeking to leverage the power of social media for sharing, the YouVersion Bible App provides options to share your daily reading with others via Twitter and email. The developer of this YouVersion Bible application is a young man who I understand worked for a time out of the Oklahoma City CoCo, where I office periodically. He has developed this iPhone app for Life Church, which is a large non-denominantional church based here in Oklahoma City. They have an Edmond campus, but I have not yet attended one of their services face-to-face. Because our own church’s Christmas Eve service was cancelled this year due to snowstorms and ice, our family actually watched part of the life LifeChurch Christmas Eve message at home. I first found it via Twitter, and started watching it on my iPhone, but then connected one of our laptops to the living room television so everyone could watch. It’s amazing to see how LifeChurch leaders are using technology to reach out to others and share the good news of the Gospel. I really enjoy using this YouVersion Bible application and plan to make regular use of its daily reading plans this year as I strive to live my life in greater balance. The program does appear to have some glitches (it gave an error when I returned to the reading plan which I’d already started) but I’m sure these will be updated/fixed in the weeks ahead. This two minute YouTube video gives a visual overview of the new reading plan options on the YouVersion Bible application. This new version is also available to Blackberry users. Get it free from Blackberry App World. 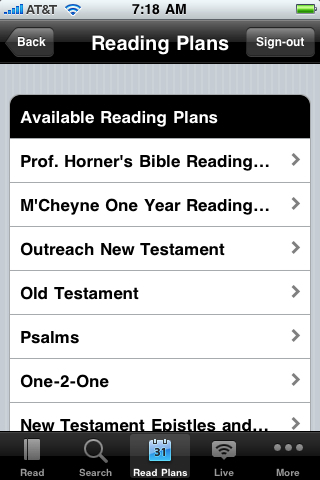 And youversion.com is worth checking out. They have audio version of Scripture being read in many different languages. Blessings to you and yours in 2010.